The stretch of Lake Huron shoreline between the Saginaw Bay and Alpena was a rough one for mariners in the 1800s, which led to the construction of the Sturgeon Point Lighthouse in 1869. Today the lighthouse, keepers dwelling and a historic schoolhouse are open as a museum site north of Harrisville in Alcona County. 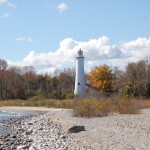 The lighthouse and tower are white with red trim, colors that really stand out against the blue waters of the lake, the sand on the beach, and the green (or in fall, multicolored) leaves on the trees that surround it. 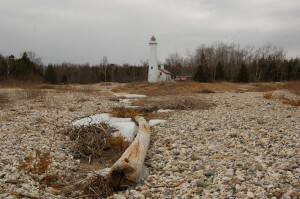 The light warns of a dangerous reef and it is still and active navigational beacon to this day. 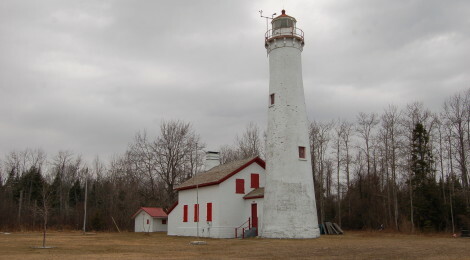 The lighthouse tower is 71 feet tall, and while these structures are in good shape thanks to a lengthy restoration project managed by the Alcona Historical Society, little remains of other structures from years past like the life saving station and breakwater. 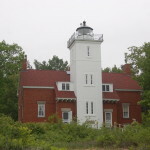 During its active years, the Sturgeon Point lighthouse was important to those navigating to and from nearby ports with timber, as the area was once one of the most prosperous in Michigan in that regard. 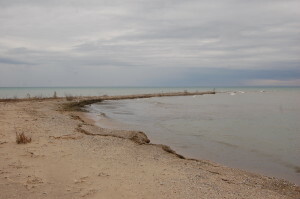 Commercial fishing and agriculture also kept these nearby ports busy but today the only chance to see a vessel is as it passes by on its journey between larger ports to the north and south. 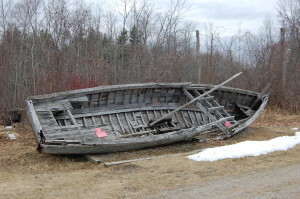 There are many maritime artifacts on the grounds, like the fishing boat “Bernice D” seen above. According to the plaque on this weathered old vessel, it is 30 feet long and a typical example of a gasoline powered fishing boat used on the Great Lakes in the first half of the 20th century. 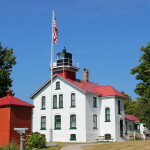 The Old Bailey School is reached from the same parking lot as the lighthouse and is definitely worth a stop as well. 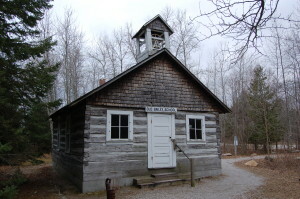 It is a one-room schoolhouse constructed of pine in the early 1900s and used at a nearby logging camp. 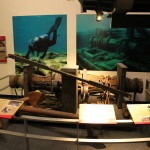 It was restored and moved to its current location in 1998, and still features furnishings from the time period during which it was in operation. Sturgeon Point State Park can be reached from US-23 by heading east on Lakeshore Drive. 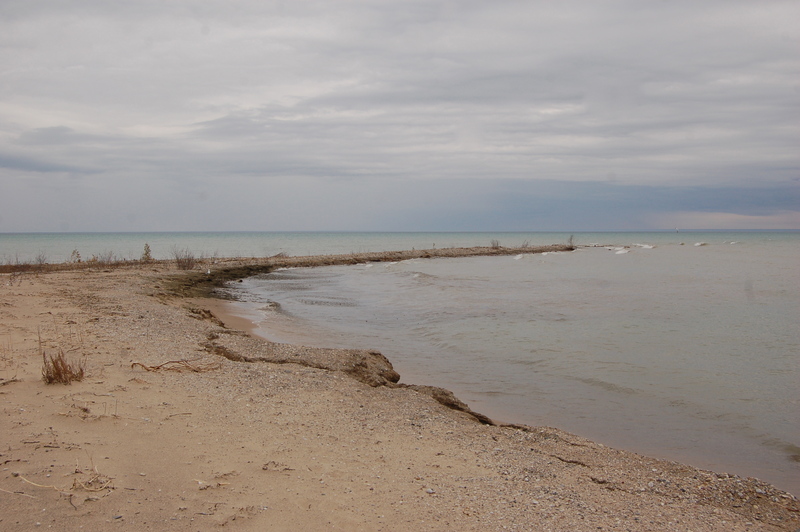 After that turn onto Point Rd. 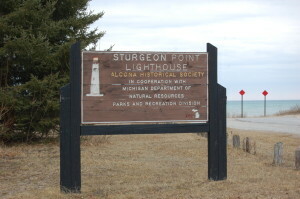 and follow it about a mile to the lighthouse complex, on the left and marked with the sign seen at the top of this post. 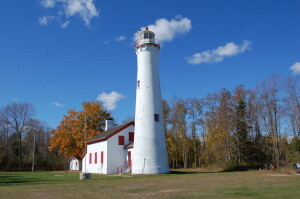 For information on summer hours for the keepers house museum, tower and schoolhouse, check out the Alcona Historical Society website: www.alconahistoricalsociety.com.